“You’ll love this house. The gardens are virtually maintenance-free.” Famous last words. If by “maintenance-free” the former homeowner meant, “anything and everything will grow even if you don’t do a thing,” then now I understand his meaning. The property I bought had been unlived in for a year. This absenteeism, mixed with extremely fertile grounds that had been carefully cultivated for almost 55 years, resulted in heavy-duty weeds starting in early April that grew at an alarming rate. This means I spend a good portion of my year with weeds on my mind. Some of my weeds have aesthetically pleasing buds of purples and yellows. Others are hideous green stalks that were over 11 feet tall when I bought the house. There is always a weed killer and weed preventer in my gardening shed, but I have yet to find the most effective product. 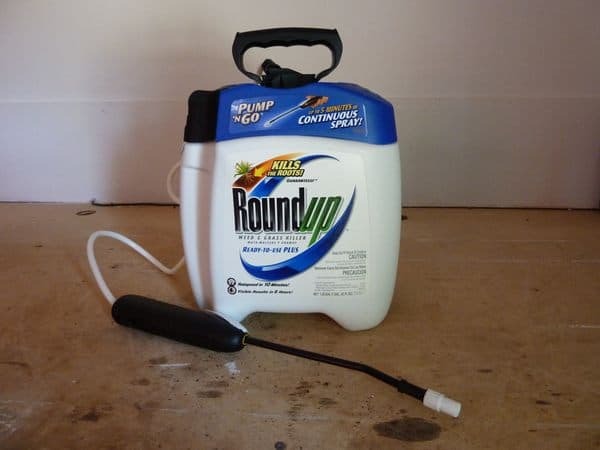 I was hopeful, for a time, that I had found it in Roundup Weed & Grass Killer Plus Pump ‘N Go (I have yet to figure out what the “Plus” part of the product name refers to). I loved the idea of being able to carry a large quantity of Roundup wherever I went. The packaging holds 1.33 gallons of solution that I can hold in one palm of my hand while holding the sprayer in the other. I imagined myself spraying every unwanted growth in sight and, using the attached precision nozzle, being able to save the nearby tulips, daffodils, and lilies to produce a truly maintenance-free garden. The package claims that the solution is rainproof after 10 minutes and the sprayer, once pumped, will provide 5 minutes of continuous spray. It seemed too good to be true. Upon first use, the pumping mechanism and flow were steady. The priming instructions were easy to follow and the spray was narrow and focused for a few minutes (definitely not 5 as advertised). After the spray stopped, just another few pumps, and I was spraying again in no time. I doused the weeds, being generous with the amount of solution I used during the first application, almost daring this product not to work. I was careful not to spray too close to my flowers and to pause when I felt a gust of wind. The instructions indicate which plants can and can’t survive the solution, but it is not an exhaustive list so still I was cautious. According to the package, I only had to wait 3 hours before noticing the solution’s effects. Smaller, newer weeds shrived actually after a few days and were easily plucked out. But Roundup was not effective on my larger, more established weeds. It took several applications before these stubborn weeds began to partially wilt. Upon second use, I attempted to re-prime the pump as instructed. After 25 pumps, I had a useless trickle of solution. After 30 more pumps–by now I am sweating–the nozzle sprayed a divided, untargeted mist, almost as if something were jammed in the sprayer hole. I was able to spray some stray driveway weeds in this manner, but the stream wasn’t concentrated enough to be used in my flowerbeds. Instead, I decided I would funnel the remaining solution into a squirt bottle. I worked at removing the lid for ten minutes to no avail. If this is a refillable bottle, why is the lid so difficult to remove? I spent some time spraying the solution into my squirt bottle using the nozzle before I got frustrated and gave up, leaving the Roundup and the nearly empty squirt bottle sitting in my garage to this day. I would be willing to struggle with the defective packaging if the product were stellar at killing weeds. But it is not. Not only is the pumping mechanism poorly designed, but I had to use an excessive amount of solution to kill the weeds (or maybe it just seemed excessive, given the extremely slow flow of liquid?). For a $20 weed killer solution, I expected much better. In my case, it makes more sense to buy weed killer concentrate for less money and make my own solution in my own squirt bottle—this way my grass is safe, too. The spray head only works the first time. Just a couple weeks later the motor ran and ran but no spray. I tried pressurizing the bottle to siphon weed killer into the spray head. Useless POS. I’ll never buy another one.